Wowsa! I must say this guy is hard­core. To most­ly every­one, they’d say he is “nuts”. 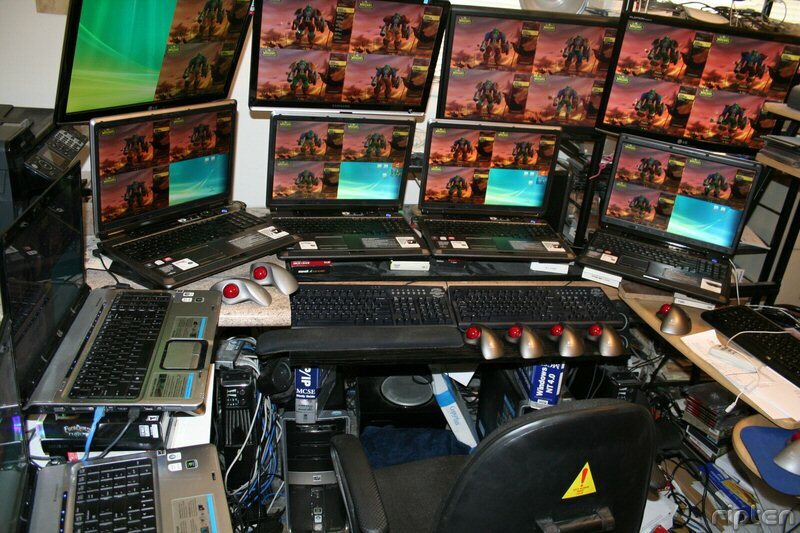 Going under the moniker “Pre­pared” in WoW, he has 36-char­ac­ters and plays them on 11 com­put­ers all at once. Dude pays about $5,700+ per year to keep all of his squad. He’s pret­ty much his own clan. Any­ways, damn… that’s just too much mon­ey and time to be wast­ing on oth­er things. For exam­ple, in Juan-fash­ion, $5,700 is 5,700 items in Jack in the Box’ Dol­lar Menu. That can feed hec­ka/mad/grip amount of peeps. I know that it won’t stop pover­ty, but that can take a good chunk of neg­a­tiv­i­ty away from it. Maybe we can have this dude take a clos­er look at what he is doing. Have him con­tribute in more of a pos­i­tive way to not only Bliz­zard but to soci­ety as well. PS. I guess this can be my Blog Action Day post as well.